In 23 games against FC Barcelona, coach Unai Emery only had one win. Now he has two. And it’s a win that cannot be begrudged. His Paris Saint Germain side was simply the best on the day, and a 4-0 win in Tuesday’s Champions League first leg puts the French club on very good course for a place in the quarter finals. All Barça can do is lick the wounds and start thinking about March 8, when the action resumes at Camp Nou. It’s an almost impossible task that they have before them, but if there is any team in the world that’s capable of doing the impossible, then that’s FC Barcelona. Nobody ever said there’s an easy ride in the Champions League knockout stage, and PSG took no time at all to make that point clear. Edinson Cavani dallied too long when through on goal after just six minutes. Then Ter Stegen got an arm out to make an absolutely fabulous reflex save against Blaise Matuidi and dealt with the rebound as well. The home side could feel unfortunate not to be leading. But after 18 minutes they were. Angel Di Maria poked a free kick straight home to send the decibel level in the Parc des Princes into overdrive. And sadly for Barça’s interests, not for the only time of the night. The pace of the action was electric. The blaugrana were out of their comfort zone, and try as they could they just could not get their possession game going. As the half progressed, their incursions into French territory did become more frequent, Neymat Jr’s blistering run followed by an Andres Gomes strike into the side-netting being the best of their chances. But PSG responded by rolling out their counter attack. Another lightning-quick response from Ter Stegen denied his compatriot Julian Draxler, but moments later the PSG striker was at it again, stealing the ball in midfield and finishing off a one-two with Marco Verratti by slipping away PSG’s second. The half-time whistle blew and for Barça things were not going to plan. But there were still 135 minutes to set things straight. Plenty of time. But the post-interval reaction didn’t come. 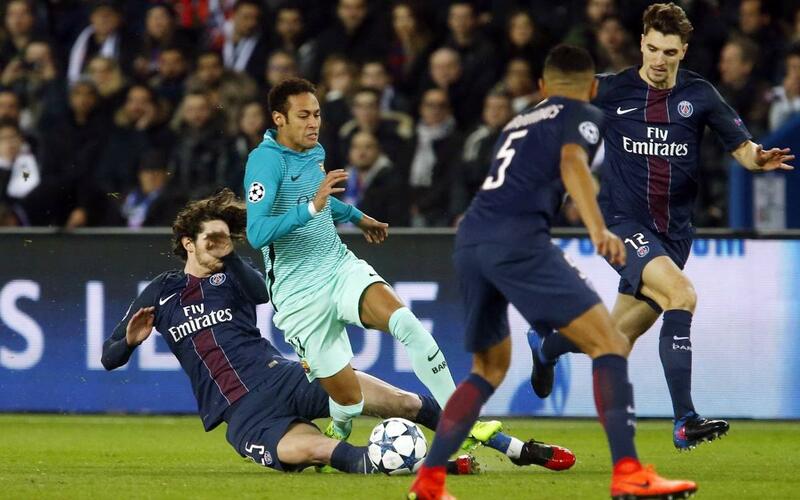 It was PSG who continued to create all the pressure. The home side had already come close a couple of times before Di Maria capped a waltzing diagonal run by confidently popping the ball in Ter Stegen’s top right corner. 3-0. Now things really were getting worrying … very worrying. Could it get any worse? It could. On 72 minutes, Thomas Meunier threaded a pass to Cavani, and the Uruguayan only needed one touch to turn the ball goal-ward. As things stood, Barça needed four goals at Camp Nou just to level the tie, while a goal for PSG would leave them needing six. Clearly, an away goal would do wonders for lightening the second leg workload. The Catalans lunged forward in search of just that. Neymar Jr sent one hurtling over. And not even when Gerard Piqué nodded a corner into the path of Samuel Umtiti could the latter do any better than head onto the post. If only that had gone in, the story might be just a little different. As it is, Barcelona are left having to do something that has never been done in Champions League history – turn around a four-goal deficit in the knockout stages. But this is a Barça side that has already rewritten the history books several times over. Now it’s time to start dreaming that on March 8 they can write the most incredible story of all. It’s a mountain, yes. It’s a monster of a mountain. But it’s a mountain that can be climbed.